Mic stands are relatively simple mechanical devices that hold your microphone for you or your vocalist when recording or performing live. 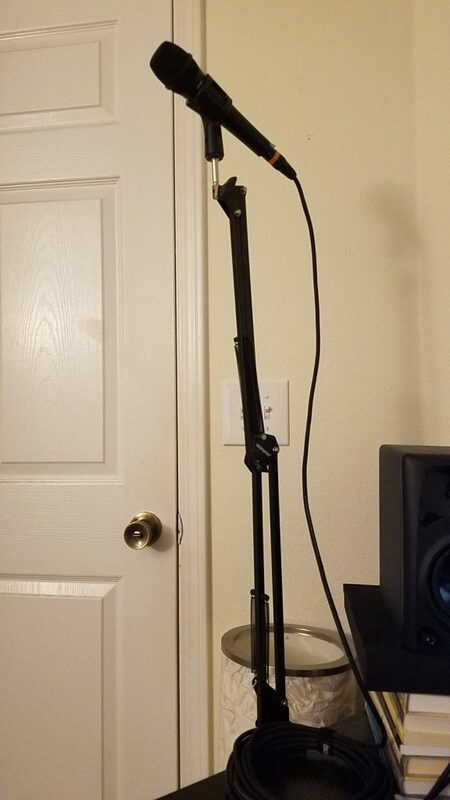 An ideal mic stand should be sturdy and rigid, and provide good acoustic isolation between whatever surface it is situated on and the microphone. There are several types of mic stands to choose from, and which one you pick depends on the application, cost, and the quality you’re willing to pay for. If you have an expensive mic, it’s a good idea to invest in a quality stand as a protective measure. Here’s a quick run-down of a few common microphone stand types, including the scissor arm mic stand. In this review, we’ll take a detailed look at the Neewer Adjustable Microphone Suspension Boom Scissor Arm Stand and see how it stacks up against competitors. Full Disclosure: This is an affiliate review. Purchasing from the links or buttons below earns me sales commission. 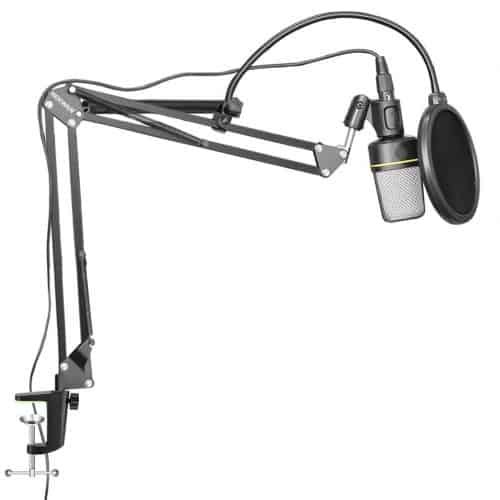 This scissor arm stand offers a good amount of flexibility and reach, and is perfect for a desk that doesn’t have much room for a regular desktop mic stand like the On Stage DS7200B or the Samson MD5. The added advantage of the scissor arm mic stand over the weighted desk mic stand is that the boom can extend high enough from the desk to record while the vocalist or performer is standing up. Neewer Adjustable Microphone Suspension Boom Scissor Arm Stand at full extension. I measured roughly 5 feet 2 inches from the floor to the middle of my mic with the scissor boom fully extended. My desk is 2 feet 5 inches high, so that puts the full extension length of the scissor boom at roughly 2 feet 9 inches. For added height, you could clamp it to something higher off the ground. You can loosen and re-tighten several of the set screws for many different combinations of positions and angles These can also be potential failure points, so it’s kind of a double-edged sword to consider. I move and adjust mine frequently and have had it for over two months with no issues. The upgraded clamping mechanism boasts added reliability over earlier designs. 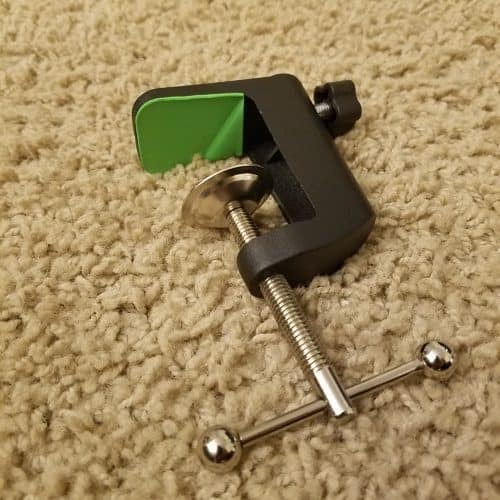 It seems like Neewer beefed up the design with more material and added a nice green sponge pad to the clamp for added grip and to stop the scissor boom stand from scratching your desktop. The maximum clamp opening depth is 1-7/8″ so if you choose this stand you’ll need to make sure your desk thickness doesn’t exceed that. Neewer made the boom arm itself out of two parallel hollow steel square 3/8″ x 3/8″ members. The members are coated with black paint. The boom arms are secured together by steel plate and bolts that can be tightened if they come loose. The mic holder is some type of flexible plastic. There are a few other comparable scissor arm mic stands out there. This stand from Earamble looks almost identical. It’s able to support twice the weight (up to 2 kg = 4.4 lbs) as the Neewer design. It also works well as a Blue Snowball or Blue Yeti mic stand, too. These are two very popular condenser mics. The Earamble model looks like it has the old clamp design though, which is supposedly less reliable. InnoGear also makes a very similar scissor arm mic stand. This one can also be used as a Blue Snowball or Blue Yeti mic stand, offering compatibility with both variants. It comes with a 3/8″ to 5/8″ threaded adapter and includes the upgraded clamp design. On the pricier and more professional side of things, we have the RODE PSA1. This bad boy is the Lamborghini of scissor arm mic stands. It too can be used as a Blue Snowball or Blue Yeti mic stand, along with almost all other professional mics. It comes with a 3/8″ to 5/8″ threaded adapter. As an add-on, you can also purchase a shock mount. Check out the Rode website for more details. As mentioned earlier, this Neewer Adjustable Microphone Suspension Boom Scissor Arm Stand is definitely a budget item. It gets the job done without breaking the bank, and is one of the more basic designs for this type of equipment. The stand definitely has a few downsides. These include a lack of acoustic isolation, noisy components, and incompatibility with some of the more popular microphone models. This can be expected given it’s cost. It also has some benefits over other types of desktop stands. The scissor arm mic stand clamps to the edge and frees up some desk real estate. This could be an ideal choice for someone without much room in their studio for more gear. It is also very flexible, with many moving parts and adjustable joints that can place the mic in virtually any point in space within the booms range. That’s it, thanks for reading! I hope this will help you find the right scissor arm mic stand for your specific application and situation, and don’t hesitate to get a hold of me if you have any other questions.